Blueprints is an intriguing abstract game where players build buildings out of dice that follow the blueprint plans they have in front of them. Each player starts with a blueprint which shows where the dice must be placed (floorplan and how high each stack should be). The blueprint shows a plan view (where players physically place their dice as they ‘build’ their building, as well as a 3-D view so it’s nice and clear. On their turn, a player can pick one of the dice from the pool of already rolled dice, and a new dice is added after each player’s turn to replace the used one. To place a dice on top of another dice, the dice on top must be of the same or great value than the one below it. As well as their values, the colour of the dice makes a difference to the players too as each material is scored differently. The game is made more interesting because the player’s blueprint are placed behind their player screen, so other players know what they took but have no idea what shape it is taking. After drawing 6 dice each, players reveal and score how their buildings compare to their blueprint. Orange (wood) dice each score 2 points for each dice adjacent (faces touching) to them; Green (recycled) dice score points based on the total green dice in the building; Grey (stone) dice each score based on their height within the building; and, Clear (glass) dice each score based on the value on their top face. Players are awarded gold, silver and bronze awards based on their relative scores and these score victory points at game end (after 3 rounds). Also, extra points can be scored by winning one of the prizes available each round and these are won for things like a building that has a height of 5 dice or higher, including 4 or more dice with the same value, etc. 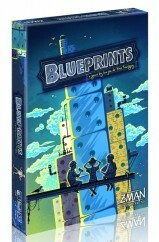 Blueprints sounds like a fun, light and different game which definitely appeals to me. The 2-player game has an extra rule where players choose 2 dice from the pool but only keep one and ditch the other which adds some nice extra interaction. This entry was posted on Sunday, October 20th, 2013 at 9:12 pm	and is filed under Blueprints, Board Games, Essen Spiel 13, Preview, Spiel 2013. You can follow any responses to this entry through the RSS 2.0 feed. You can leave a response, or trackback from your own site.